Janet Chase Harper proves that you can be fit at any age. The 97-year-old CPHHS alumna (’41 home economics) is still mentally sharp and fit as a fiddle. After breaking her femur and having surgery two years ago, the Junction City resident rides a three-wheeled tricycle each day on the farm she lives on independently. She’s happy to be getting around and uses a cane or walker when needed for security. Two of Janet’s children, Marilyn Rear and Warren Harper, live nearby in Junction City. Another daughter, Eileen McLellan, lives in Bend. “The adult bicycle was a gift for her 95th birthday,” says Marilyn. “Every day she makes sure she rides up and down our paved country road. It’s about a mile, and she often rides several times a day.” Marilyn says her mom also enjoys picking her strawberries, asparagus and pulling weeds. Janet finds use for her tricycle in more ways than one, using its basket to cart her farm tools. She rides because she genuinely enjoys it and it’s a natural fit for life on a farm. She likes riding by the growing crops and the horses at the nearby stables, enjoys the changing seasons and watching the moon rise. She’s often seen waving at neighbors as they drive by. Her secret for staying healthy includes eating a good diet with lots of vegetables, berries and meat. She also says “yes” to social invitations from friends and sticks to routine exercise. She likes to challenge herself but not compete with others. Sleep also tops her list of priorities. Her current routine is a reflection of a lifetime of activity, which she passed on to her children. Marilyn says that growing up on a farm made the family involved with physical activities, including working in the crops, hoeing, moving irrigation pipes and picking up boxes of cherries to put on the truck and haul to the cannery. Following her graduation from OSC, Janet worked on her parents’ farm for the summer. 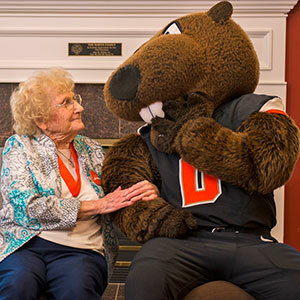 In October, she began working as a secretary in a real estate office and then as a home economics teacher at Vale High School in Vale, Ore. She served as the president of OSU’s Mothers Club in 1977–78 and was involved with planting Trysting Tree II on OSU’s lower campus. Janet was also the president of Junction City Business and Professional Women and a Girl Scout and 4-H leader. Hats off to you, Janet! Keep up that youthful spirit and attitude as you remain forever young.